The Bailies of Bennachie have been awarded grant from the players of the People’s Postcode Lottery to train local people in wildlife survey and recording. The Bailies are keen to encourage local people who want to improve their wildlife identification skills and who are willing to submit records of their wildlife encounters on Bennachie. So, in 2017 we are running a programme providing opportunities to learn more about surveying and recording mammals, birds and plants. Public events - We will be holding events open to everyone during the year which we’ll publicise in local papers and on our Facebook page. Training courses - We have special opportunities for members to participate more fully in wildlife recording on Bennachie. We are offering in-depth training courses to teach you how to identify and record mammals (10 days), birds (12 half days) and plants/vegetation (6 days). The training courses are for adults (over 18) who are physically able to walk several kilometres over rough terrain. 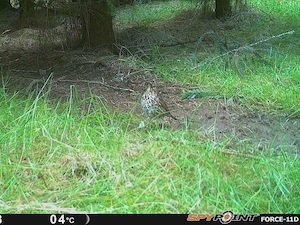 Trail cameras – the Bailies have several trail cameras to loan to members prepared to look after the cameras, set up them up on Bennachie, regularly check what they find and submit the wildlife records. We will train people how to use the cameras to record wildlife. If you want to help the Bailies us find out more about the wildlife on Bennachie then please Contact Us for details. Please can complete the Volunteers Application form.